Designed and built in Kentucky, the VC-500A/5X AM HWD offers manufacturers part-processing capabilities beyond those of conventional Multi-Tasking to reduce lead times and part costs, increase machining accuracy, improve part quality and achieve even higher levels of productivity, flexibility and profitability. 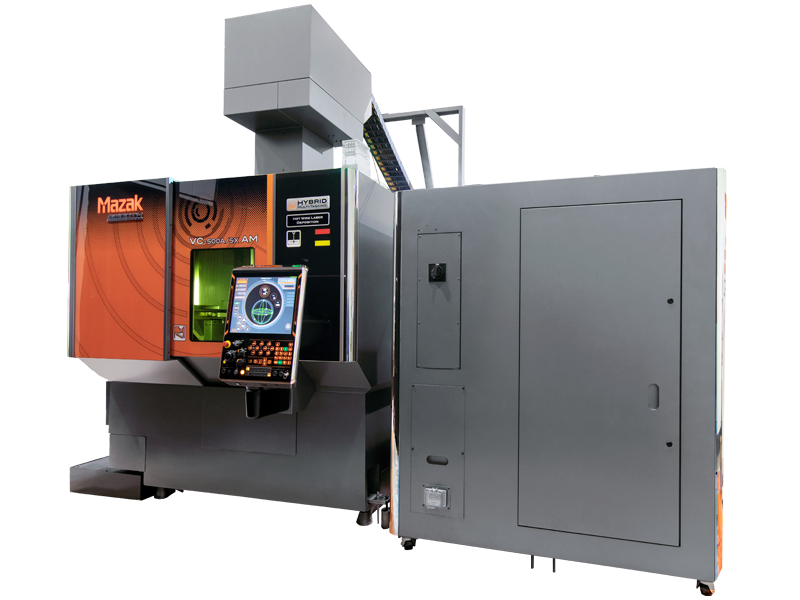 The VC-500A/5X AM HWD incorporates the new and innovative HOT WIRE Deposition technology, an additive manufacturing technique that Mazak developed in collaboration with Lincoln Electric. Unlike conventional welding, the HWD head uses both an arc torch and laser to precisely melt metal wire directly on to a base material and/or part at a rate of three to four pounds per hour. The two materials – wire and workpiece – can be dissimilar, which allows shops to generate exceptionally precise sealing coatings along with near-net shape part features. The machine may also be used to repair costly complex components such as impellers and turbine blades along with tool and die parts. On its milling side, the VC-500A/5X AM HWD comes standard equipped with a robust, high-performance CAT-40, 12,000-rpm spindle that delivers exceptional metal removal capabilities in all common materials, including steel, aluminum and cast iron. An ample 30-tool storage magazine ensures continuous uninterrupted part machining, as does the machine’s compact chip conveyor and mist collector with smoke filter.